Thank you and congratulations again on securing your place for this Course in May on Saturday 18th and Sunday 19th. Below are some notes that you’ll want to review before attending, especially the Kit List. Please also read all the notes below this. If you have any questions or require any clarification please contact me personally, by email, message online, or better still, just call. As mentioned in the Course Prospectus online, you’ll need to bring some materials with you for this Course. You’ll find the full list below. If you already have some oil (or acrylic) painting materials that you’re used to using please do bring anything with you that you feel you may want to use. It’s better to have these with you, even though you may not need them. Canvases will be supplied. You’ll be working on two pieces over the weekend. However, if you want to bring any other canvases with you (stretched or on panel) again, feel free. We’ll be working with limited colours initially, then adding secondary colours on Day 2. I will have some paint supplies available but you will also want to bring some with you. Standard size tubes are fine. You may have a preference for a particular make of paint. However, Winsor & Newton ‘Winton’ Range is perfectly adequate in quality. If you want to go for top quality paints, which are certainly not required, but still lovely to use, then look at Sennelier of Paris and Michael Harding paints. Just remember to get standard Oil Paints, not water-based or any other variation. Optional colours include – Indian Yellow, Venetian Red, Transparent Oxide Red. And bring any other colours you keep in your box, you may want to use them. I highly recommend the use of Winsor & Newton Liquin for working in oils. This is a well tried and tested medium that also speeds up drying times, which will help us over the two days. This medium is available in various types, you’ll want Liquin Orginal and maybe Liquin Impasto. You won’t need to bring any additional oils, but may want to have some turps. You’ll want something to mix your oils on. This can be a traditional wood/plastic palette, glass or perspex sheet, or you can even use the tear-off palette pads that are available to buy. A good palette knife (or more correctly termed a ‘Painting Knife’) is probably the most important art tool you need. I always recommend buying a good one, or even a small set. I’ll be teaching some interesting techniques with these knives. Avoid cheap plastic knives and buy a better quality metal one, which are not very expensive anyhow, and these should last you a lifetime. As every artist knows, it’s so easy to fall in love with nice brushes and end up buying lots. True, you can never have enough brushes but for this course you’ll only need a few. For oil painting you really want bristle brushes, although if you prefer you can use a synthetic version but these should still be fairly firm. Personally I use and highly recommend Black Hog and Shiro brushes by Jacksons Art Supplies (see below), which are very good quality and value. Brush types and sizes – I recommend you use Filberts (these have a rounded tip), although you may also want to bring some Flats (square tips). Sizes from 8 – 16 are good. If you like you could get an 8, 10, 12, 16. If you only want to bring a couple then get an 8 and a 12. A smaller brush or two may be useful as well. You’ll need to sign your artworks at the end! Blending brushes are also good and we will be using these for big area work as well. I will be supplying some of these but again, feel free to bring any with you. Even a simple 2” house painting brush (with softer bristles) can be really useful. As mentioned in the Course Prospectus, you’ll need to bring an easel with you. I always teach painting standing (for a very good reason I’ll be explaining). So ideally you’ll want a standing easel. However, if you feel that painting for two days on your feet is going to difficult, then you can certainly sit, or use a table-top easel. 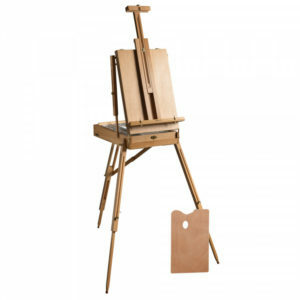 If you’re looking to get a good easel I would certainly recommend a French Easel. These fold down into a carry box about the size of a briefcase, often used by Plein Air artists painting outdoors. They also hold brushes, paints, etc. Fully adjustable they can take small canvases and anything up to 36” x 28”, as long as you’re not in a gale. French Easels come in various qualities. I’m lucky enough to have my Father’s original easel, which is a real treasure to me. At the top end you can look at French Easels by Jullian of Paris, however, I’ve used a Chinese-made version, bought online for about £50 and is perfectly serviceable. Other easels, like ‘Devon’ easels are good too. Just make sure you bring something that will take a canvas of about 24” x 18”. If you have any problems with bringing an easel with you for the Course please let me know as I may be able to lend one or two. It goes without saying that wear something comfortable for the course. You may get paint on your clothes, so leave the Prada at home! It’s going to be late May, so I’m hoping we’ll have some lovely weather but do bring some layers just in case. As mentioned at the top, if you’re an artist and already have your art paraphernalia that you’re comfortable with, please bring anything else with you. I personally use a number of suppliers. I try to shop locally but this just isn’t always practical for me. 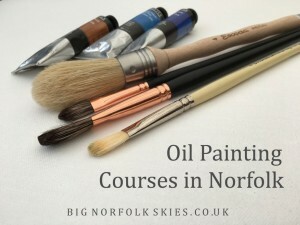 However, if you’re in Norfolk and close to Norwich I suggest looking at The Range based in Bowthorpe, or also online. They have an excellent art section with almost everything needed and are very competitively priced, even compared to online-only shops. Norwich Art Supplies on St. Benedict’s Street in Norwich is a great little shop with very nice staff and good quality materials. Online I personally use Jacksons Art Supplies, who can be found direct or on eBay. The carry a huge selection of materials and very well priced. I also use Curtis Ward and Skipton Art Shop. If you have any problems or questions with art materials please contact me personally. NB. I have no commercial connection with any of the suppliers mentioned above and can only give my recommendation based on personal experience. Here are some quick notes about times, parking, food, etc. The Course times are 10am start, 1-hr for lunch, around 1-2pm, then finish by 5pm on each day. We’ll be leaving a little time at the end of each day for clean-up and I’ll be supplying materials for this. However, I need to make you aware that we’ve got to be prompt on our start times. This is because the Hall only opens officially at 10am. The room will be set up (mostly) ready to start. So I’m asking that all Course delegates arrive at the Hall before 10am and ready to go in once doors open. We can then quickly set up easels, materials and then get on with the day ahead. If you are going to be late on either day please let me know. If you’re driving and held up by traffic, just arrive in your own time and take care. We will start as soon as we’re in the room and set up. As mentioned in the previous information, I’ll be providing refreshments (tea, coffee, soft drinks, etc.) during the day. You’re very welcome to bring any snacks with you that you might want to keep you fueled. For lunchtime you’re welcome to bring a packed-lunch and enjoy the outside. Alternatively, there is a very nice café/restaurant at the Hall, which you’re welcome to use of course. And there’s also the Pub next to the Hall, which is excellent. Just remember we only have an hour for lunch! Again, car parking is onsite at Blickling Hall. 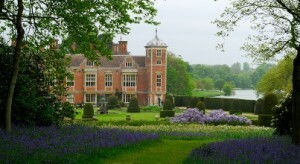 As National Trust estate there is a daily charge of £5. Very much looking forward to this Course and painting with everyone. You may also want to bring a notepad and pen to record some ideas and notes from the weekend. As mentioned, several times above, if you have any questions at all please get in touch with me as soon as possible.